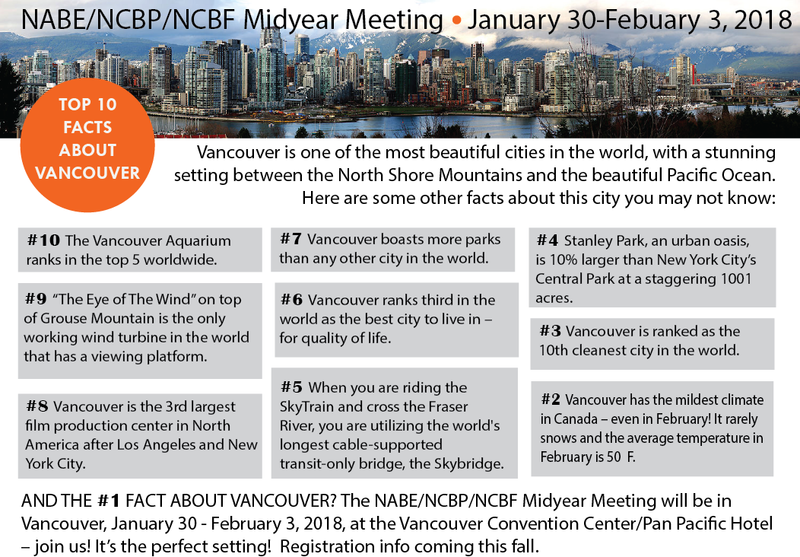 Meeting Venue: All NABE business meetings, programming, and events took place at the Vancouver Convention Centre East, 1055 Canada Pl, Vancouver, BC V6C, Canada, unless otherwise noted in the program/agenda. Hotel Information: The NABE 2018 Midyear Meeting headquarter hotel was the Pan Pacific Vancouver, 300 - 999 Canada Place, Vancouver, BC V6C 3B5, Canada. Transportation: Visit Vancouver's guide on Getting Around. Weather: The average high temperature in Vancouver in January is 46°F/8°C and the average low is 36°F/2°C. Click here to view the final agenda and program. Handouts for the NABE 2018 Midyear Meeting were not be distributed onsite. Thank you to our Midyear Meeting Sponsors. Plan your trip at Vancouver: Spectacular by Nature. Please be sure your passport is up-to-date and not expiring within six months of travel to Canada. Please visit the U.S. Passports and International Travel web page for Canada for more information about travel to Canada.